Video ads pop up in plenty of mobile games, but the strange thing is, they only ever advertise other mobile games. Stranger still, they often advertise games that belong to competitors. That seems short-sighted, since you’re presenting your players with your competitors’ games. That aside, though, advertisers are missing out on an opportunity. Many mobile games are integrated with Facebook, and advertisers can get loads of information to tailor their ads to those players. I realize that video advertisements are seen kind of annoying. Ads break the flow and pull you out of the experience. However, when it comes to TV, we put up with it. Why is that? My speculation is that this is because TV shows build the ads into their flow, pausing at dramatically appropriate moments. It’s my belief that if games want to use video ads, they need to work them into the design. Game experiences are heavily reliant on pacing and flow management, and AdventureQuest Worlds discovered a unique method of integrated advertising into that pacing and flow. When you die in that game, players have to watch a short ad. What a clever idea! You usually want a small break after a player dies in the game, a moment to let the death sink in. That’s a moment when a player is highly engaged with the game, so their attention is at a high point. It’s prime temporal real estate for an advertisement! Not one that’s too long, but it’s a good spot nonetheless, and I’m surprised we haven’t seen more games try to emulate this. There are also games like the now-defunct Sims Social, which had events advertising real world products. 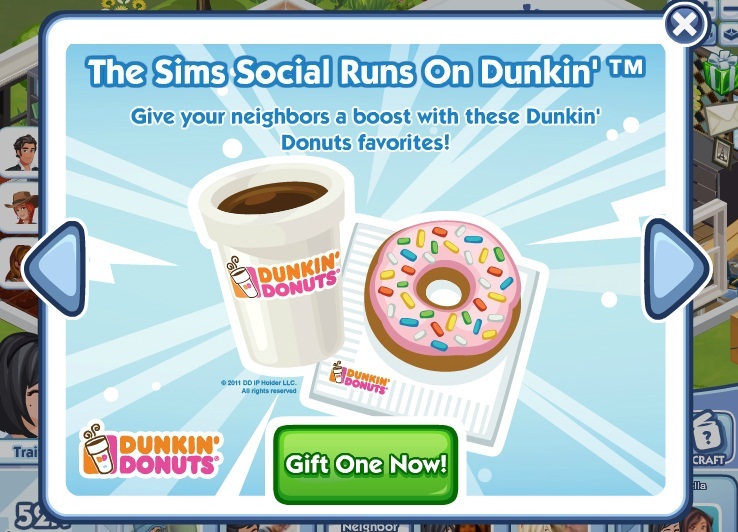 This had the benefit of integrating the game into the world itself and creating a limited-time event item. Ads can’t always be tailored specifically for games like this, but it might be the ideal way of integrating advertising with a game. With all that said, if a viable method were found to support a game entirely through advertising, in-app purchases could afford to become less central to a free game’s design. Sure, in-app purchases might still exist, but the entirety of the game would no longer have to be chained to the habits of the 1% of players who pay money. Free to play games are often accused of being exploitative and soulless, and many of those accusations are based around the in-app purchase monetization model built around this 1% of players. I think there’s certainly a place for in-app purchases in game design, but if companies could discover how to elegantly integrate advertising and monetize the 99% of players who don’t pay, then the game could be designed without the assumption that in-app purchases are its lifeblood. Unfortunately, the situation right now is tricky. Advertisers aren’t making ads for games, and people who make games with in-app purchases are wary of experimenting with them, and rightly so: It’s hard enough to get players and convert them to paying players. Why take a huge risk, show them ads, and drive them away from the game? Eventually, someone’s going to figure it out, but let’s not be passive about this. This isn’t just about making money. It’s about freeing designers and giving them more creative flexibility to create better games. Free to play’s been featuring heavily on my mind lately, and I figured I could shed some light on how freemium games make their money. This applies to all free to play games. This is not exclusively a casual concept. Remember that Team Fortress 2, League of Legends, and DotA2 are all free to play games. Many of these lessons, I learned from Design Rules for Free-To-Play Games. Specifically, the extra chapters you get for buying the eBook version. To understand free to play games, you need to understand three major concepts: Acquisition, retention, and monetization. These are stages of a player’s life cycle, and the company wants to make sure that as many players get to that final stage as possible. This is the process of acquiring a new player. Getting new players usually comes from spending money on marketing and from organic growth when users get their friends to play. A key concept here is the Cost Per Acquisition (CPA. Also called CPI or Cost Per Install, but let’s stick with CPA), which is how much it costs, on average, to get a player to start playing your game. Retention is keeping those players you just spent money to acquire. This is often described as seven day retention, thirty day retention, or something along those lines. A seven day retention rate of 50% means that half of the people who sign up for your game are still playing it a week later. A game with a high retention rate is one that players keep coming back to. Eventually, though, every player stops playing a game, and this is called churn, the opposite of retention. A game with a high churn rate is a game that players aren’t sticking with. When a player decides to spend money on your game, that’s when they’re monetized. If you’re lucky, you’ll see a 10% conversion rate (a term to describe how many players decide to convert into paying players). This is what pays the bills and keeps the game running. The important concepts in monetization are Average Revenue Per User (ARPU), Average Revenue Per Paying User (ARPPU), and Lifetime Value(LTV). ARPU is how much money you get on average from each player you have. ARPPU is how much money you get on average from your paying players. LTV is how much money a player is likely to pay, on average, before they quit playing. The success of a freemium game can (in extremely broad terms) be summarized by comparing the Cost Per Acquisition to the Lifetime Value. This is how much money you spend to get someone to start playing your game and how much money they’re likely to give you before they stop playing. If you have a low CPA and a high LTV, you’re doing great! On the other hand, if you reach a point where you’re paying more to get a user than they’re going to pay, it’s probably time to sunset the game. For the most part, design in a free to play game is about retention, retention, retention. That isn’t to say that designers can ignorer acquisition or monetization; the game would fail if they didn’t. I just mean that retention helps with acquisition and monetization all by itself. A healthy retention rate means players stick with a game for longer, giving them more time to convert to being a paying user and giving them more time to convert into a paying user and boost LTV. A game with great retention means that the game gets a large community with a lot of seasoned players who can drive organic traffic and bring in more users, who will themselves bring in more users, which drives down CPA. There are techniques you can use to design retention into a game. Giving players rewards for logging in on consecutive days is a popular one, and getting the player to schedule appointments to check in on the game (Come back in 24 hours to harvest your strawberries!) is also common. There’s one technique even more common than those two, though, and it’s a technique that every game, freemium or not, strives for, and achieving it has been the subject of countless books and endless debate: Just make the game fun.